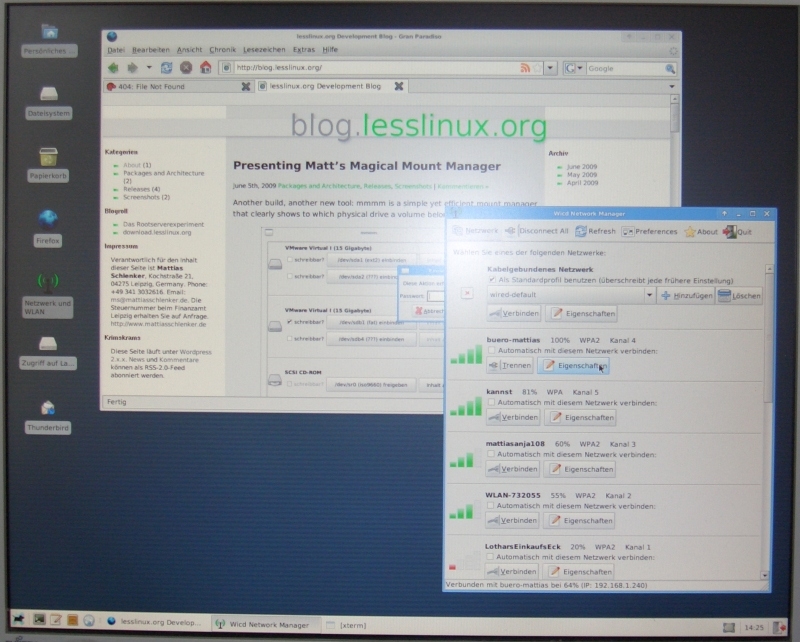 Install LessLinux search and rescue to a thumb drive. 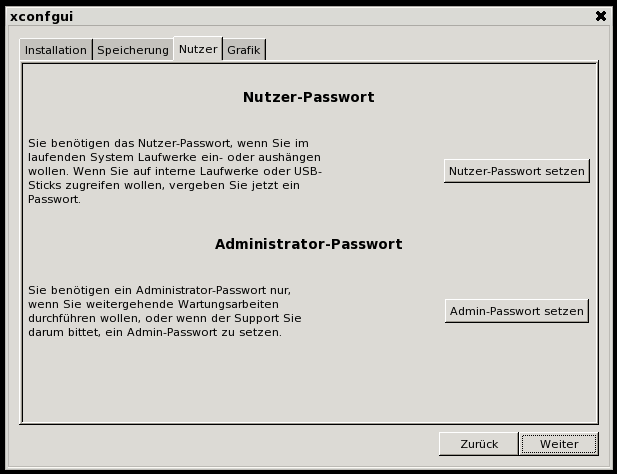 In the installer you can select the default language and specify if an encrypted /home partition should be created. The latter feature is especially handy if you want to store some browser bookmarks or WiFi keys. Webdav is a nice thing, especially since many providers like Deutsche Telekom or GMX are offering cheap or free Webdav drives. I included the command line client mount.davfs. Currently no certificates are installed and in the mid term I want to provide a simple GUI. As alwas you can download the ISO image lesslinux-search-and-rescue-uluru-20130822-085558.iso from download.lesslinux.org. 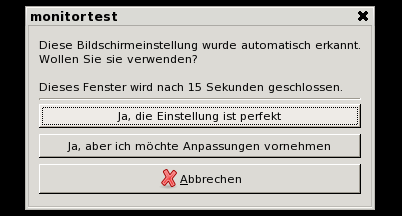 Burn it to DVD, write it to a thumbdrive with “dd” or Win32DiskImager. The last weeks saw many improvements that especially targetted reliability. 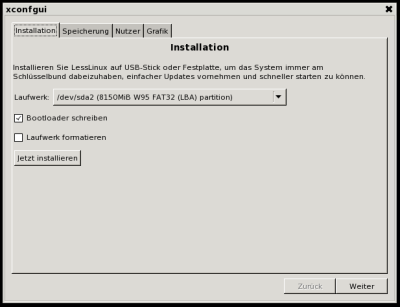 As you probably know, LessLinux contains a feature called “ISOhybrid conversion”: Official ISO images are valid HDD images as well, so you can either burn them on a DVD or “dd” them to a thumb drive (Windows users will take Win32DiskImager to write to an USB drive). Upon first boot, the ISO image is move to the end of the thumb drive and some partitions are created – so part of the thumb drive is still writable and the boot configuration is editable. During the last weeks I ran into problems with some cheap USB thumb drives: continously reading 8MB and instantly writing them somewhere else often resulted in some flipped bits. Thus I introduced some checks: First, and upon each boot, the binary files in the initramfs (BusyBox, some statically linked binaries, firmware files and kernel modules) are checked and upon failure the system shuts down. 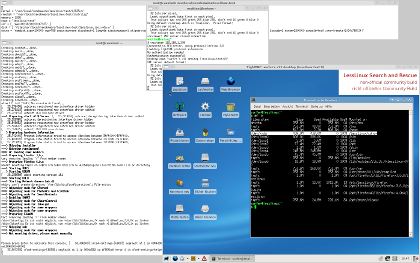 Then before doing the ISOhybrid conversion boot files (kernel and initramfs) and the SquashFS containers are checked. During the conversion each block is checked after writing: if moving fails, it is tried again. Some very cheap thumb drives that formerly resulted in nearly 20% corrupt installations are now down to 2%. Another big change in ISOhybrid conversion is, that we are now very generous with available space: In addition to the last partition for the ISO image, another partition in front of it is created. Both use 125% of the space of the ISO – yes, 250% together. The intention behind this is, that updates are handled much easier this way: The old ISO image can now be piped through Xdelta3 and the STDOUT can be written to the empty partition. As a result, I will begin to offer updates between stable releases from now on. upon first boot, during ISOhybrid conversion a partition with between 512MB and 1.5GB is created and later used for storing the contents of the home directory and settings for WICD. Reasonable sizes for the /home directory are between 256MB and 64GB (if you install to a USB hard disk and have some large directories in your /home directory, e.g. Thunderbird will full IMAP caching). Some ransomware writes a shell entry that cannot be removed from a running windows system. I was disappointed with license and usability of Kasperskys ransomware removal tool, so I wrote one myself: This tool scans all your hard disks for Windows installations (currently XP, Vista, 7 and 8 are supported, 8.1 might work as well), then it reads the shell entries and gives you a button to reset the shell to the default “explorer.exe”. I created some commonly used functions for displaying a progress bar during startup and ISOhybrid conversion. Sadly, kernel 3.10.5 contains some bugs in some wireless staging drivers that result in no connection or crashes (especially sad when considering those drivers worked in 3.9.11), so I had to blacklist rtl8192se. To speed up boot, ethernet drives are loaded after udev is started. 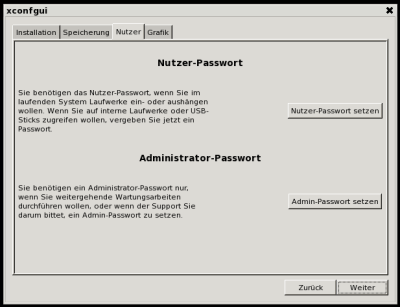 If you intend to netboot lesslinux, please take a look in the handbook. 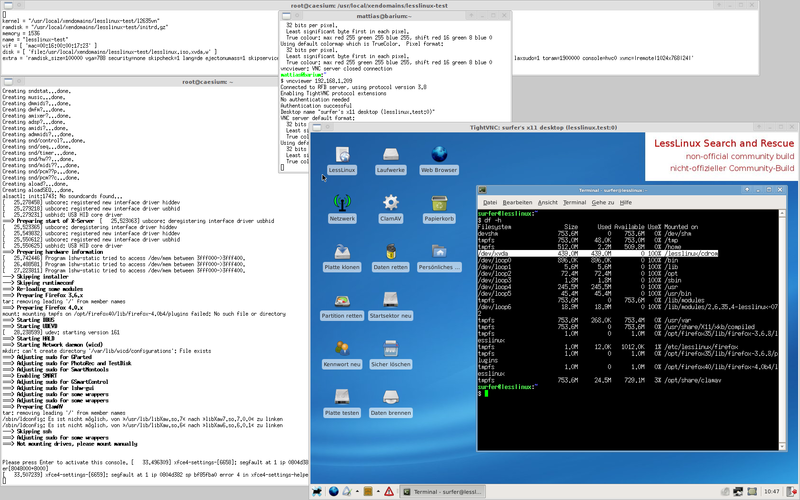 Download the build lesslinux-search-and-rescue-uluru-20130807-124945.iso and burn it to DVD or use “dd” or Win32ImageWriter to write it to a thumb drive. PS: This build still uses Firefox 22.0 and Thunderbird 17.0.8, some pending updates on the Xorg subsystem are not yet included and I plan to add and configure GRUB as an alternative bootloader on UEFI systems (in the mid term, this should reduce the size of ISOs by ~50MB). So now you know why the build is labeled testing. From the stability standpoind there are no reasons (besides the broken WiFi drivers) not to use it. I am proud to present release 1.5 of LessLinux Search and Rescue. This is the first stable, open and free release from a series of rescue and recovery systems previously featured in magazines like Computer Bild. The CD targets both users unfamiliar with linux who are in search of a easy to handle live system as well as administrators or anyone familiar with linux. For the latter group the command line offers tools found on every better rescue system, but also many “cheatcodes” (boot options) to enable netboot or remote administration via VNC. The former group finds some convenient graphical wrappers for typical tasks like resetting Windows passwords or wiping hard disks. ISOhybrid conversion: Starting with version 3.8x of the Syslinux bootloader an ISO image can be prepared to be a valid hard disk image. Isolinux will boot this image in any case. There is one drawback however: A USB thumbdrive with this ISO image does not contain a writable filesystem anymore. 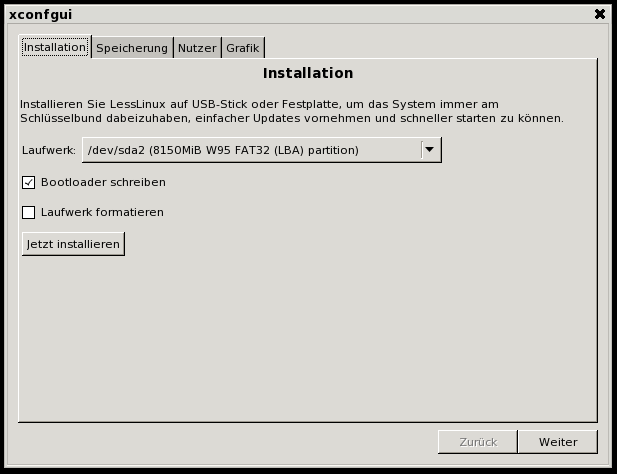 Current LessLinux builds include a conversion routine: If sufficient RAM is found, the complete content of the ISO filessystem is copied to RAM during startup, the thumbdrive is reformatted as FAT32 and a Syslinux bootloader is written. 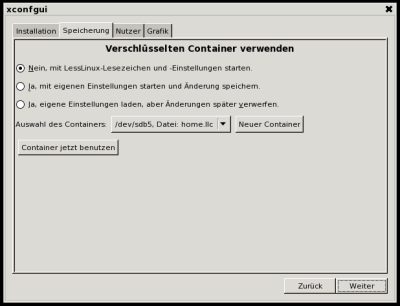 To test this feature, use dd to copy the ISO to the thumbdrive: dd if=lesslinux.iso of=/dev/sdx. On Windows rename the ISO to .img and use Win32ImageWriter to perform this task. Start as Xen domU: With pvops Vanilla kernels getting mature it is possible to boot the same kernel on bare hardware and as Xen domU on the hypervisor. With small changes to the kernel configuration and the startup scripts (to search on Xens harddisks xvda and to open the console hvc0) LessLinux now boots on Xen. The practical usage of this feature will be for development and debugging, but it also offers the possibillity to offer lightweight live distributions as maintenance and rescue systems for hosting environments. Then use this configuration file to fire up the domU. On pressing the Return key on hvc0 you get a simple shell where you can use ifconfig to determine the IP adress. 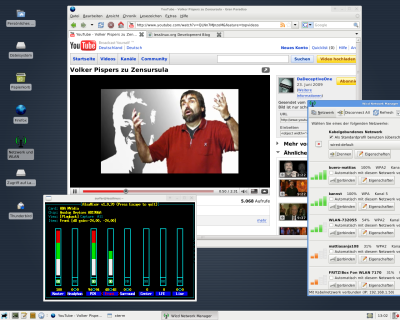 Then use VNC to connect to the desktop of your LessLinux-domU. Currently installation to USB stick and creation of encrypted containers does not do a check of free space. So you have to take care yourself. Besides that those functions work very well. If you want to help, plese download the latest development build and run it. Please provide feedback: I would be thankful if you provided me with some feedback regarding graphics and resolution on your hardware. If something does not work perfectly, please describe the problem and send me you hardware information so I can work on a solution. You might prepare an USB stick with an empty folder “hwinfo”. LessLinux writes an archive with lots of hardware information to this folder. Send me the content along with a description of your problem and I will try to solve it. What’s next: I am now working on separating message strings from the tools to prepare some internationalization. WLAN support also has a high priority and the mount tool should follow soon.